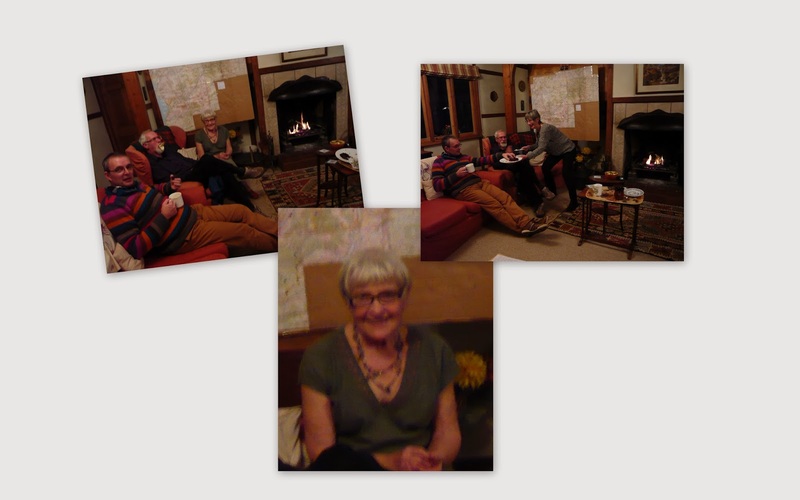 We held our annual Merioneth Nats social meeting yesterday at my house, Quillet, Llandrillo, sadly, for the last time, as I will be moving to Preston before Christmas. Recording in the county will continue from a static caravan in a nearby site which we will be using as a base several times during the year. As usual I forgot to take any photographs until it was almost too late but these give a flavour. Twelve people gathered for soup, bread and cheese with other goodies including Polly's gorgeous home-made brownies and a magnificent chocolate cake brought by Paul. We decided to stick next year to a monthly meeting, on the fourth Thursday of each month [except in January, as the caravan site will be closed then]. dots showing the number of records, black= 51-100, red= 101-150, blue=150-200 and green=>200 records. 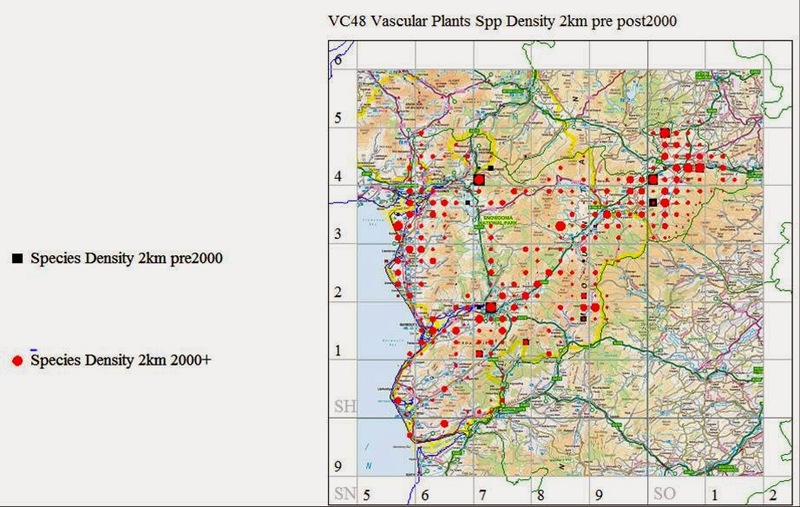 I couldn't reproduce the dot map, but this distribution map, taken as a screen shot from the county Mapmate database shows pre and post 2000 species density. We have a huge amount of work to do before 2020!! Spurred on by these data, Martin, Clare, John and I decided to do our planned walk in an unrecorded square so we chose one near Parc, SH83X which had no tetrad records at all! We came home triumphant with about 110 records in the bag enabling me to put a red dot on the map straight away! Not bad for Friday, December 13th! This seems a good occasion to thank all those who have turned out and supported my meetings month after month - also everyone who came to Caerdeon providing more records there, too. I am looking for even more help. I am getting rather creaky in the knees and would be delighted to have any offers of practical help in leading meetings in the more remote parts of the county. Eventually I would like to find someone who would share the recordership and eventually take over from me, so if you feel you fit the bill, please say. The requisite skills, it seems to me, are a degree of botanical knowledge and organisational skills, but above all a passion for botany - and, really importantly, knowing what you don't know!! !